More disabled persons need to find the confidence to ambush mainstream spaces for inclusion to become a reality. These comedians have certainly set the ball rolling for others to follow. Their acts draw from life experiences and are much more than just a few jokes about a blind man’s misfortunes. Here’s a list of a few such comedians who are blind and making waves in the world of stand-up comedy. In the future, one hopes that inclusion is a reality, and lists of comedians will be all-inclusive, with everyone competing on an equal footing for the best spot. Till then, here is a list of the ones who have pushed the limits with their comedy and used it to make people rethink stereotypes and bust myths, apart from of course leaving their audience in splits. Sundeep Rao, a former IT company employee, got bored of his job and decided to venture onto the comedy scene somewhere in 2010. He made his debut at Vir Das’s amateur night, and since then there has been no looking back. Fearing being typecast as a blind comedian, initially he attempted to avoid talking about his eye condition. But today, Sundeep is far more comfortable talking about and laughing at his disability on stage. 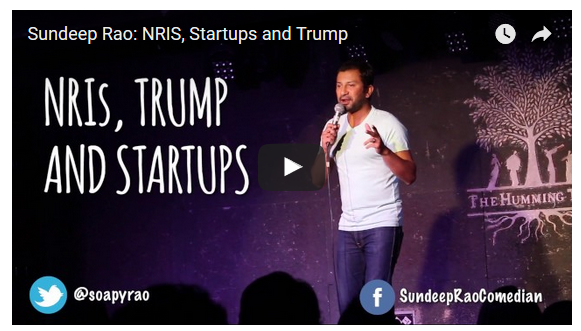 Here is Sundeep staying current with the funnies on Trump, NRIs, and startups. Happy laughing! Currently a disability and gender justice activist in Mumbai, Nidhi works to educate people about disability and sexuality. Her sense of humour has always prevented her from overreacting to repeated ignorant comments about blindness. One of her friends and fellow activist dared her to give stand-up a shot. Six months down the line, Nidhi had a script ready, loaded with stories from her own life, narrated with a pinch of exaggeration to heighten comic effect. Since then, she has been travelling around the country, getting audiences to loosen up about disability and laugh at her experiences. Watch Nidhi get candid about relationships, arranged marriage encounters, and PDA. Soon after Chris McCausland graduated with a degree in Software Engineering, his eyesight began to deteriorate. His early attempts to develop websites bombed, with his designs getting uglier by the day. He dabbled in sales for some time until he quit that too and sat at home. Bored out of his head in 2003, he finally wrote a five-minute act and showcased it at a comedy club. That was the beginning of his career as a stand-up comedian. Chris believes that being able to laugh at his blindness allows audiences to open up to the idea of a blind guy on stage cracking jokes. Watch Chris hilariously describe his experience on the London Tube. Troy Hammond has been in the comedy business for over 30 years. The trigger came from a comedy writing class he was enrolled in at the Ohio University while studying communication. His comic act extends from hilarious misconceptions that people tend to have about being blind, to clever ways of cleaning the house using his cat. Troy’s timing is impeccable, and the delivery spot-on. His observations about politics, religion, and people can leave audiences in splits. His perspectives on politics, religion, and America, teamed with his excellent timing, can lead to serious bouts of laughter. Watch Troy leave audience in splits with his hilarious accounts on dating and blind dating. Another comedian that proves that blindness in no way prevents a person from having a great sense of humour is Gord Paynter. Having dreamt of becoming a comedian since the age of 3, Gord was highly dejected when he lost his eyesight in his early 20s. But soon he realized that the lack of sight in no way affected his sense of humour. He began performing at comedy clubs, landing a TV show here and there, until in 1984, he got his first big break at an amateur stand-up club in Toronto. From 1984 to 2012, Gord performed across Canada and America, connecting with audiences and finding ways to make them laugh at the funny side of being blind. From the archives, Gord Paynter sharing funny anecdotes and experiences from his life. There are so many more blind persons out there trying to make a living from being funny. Some of them include Jamie Macdonald from Scotland (If you can make it past that Scottish accent), Kelly Blind from Nigeria (If you speak pigeon), and Darryl Lennox and Georgie Morell from America. Perhaps in time we will see a lot more of them. So the next time you meet a blind person, think twice about what you say, because if he or she is a comedian, then you might land up as part of their next comic act!